Georges Haquette was born in Paris in 1854 and received his artistic training from Aime Millet (the sculptor) and Cabanel – two important artists of the 19th century. It was from Cabanel he mastered the art of figure painting and his choice of subject matter was greatly influenced by many of the French Realist artists of his time, included Courbet and Millet. The theme of the peasant was a favorite among the artists of the time, but while most were concentrating on peasants harvesting the fields, Haquette chose to portray the harvesters of the sea. He made his debut at the Paris Salon in 1875 and exhibited there throughout his lifetime, receiving an honorable mention in 1878, the third class medal in 1880 and the second-class medal in 1901. Among his exhibited works were: Un homme à la mer! (1886), La femme du matelot (1887), La levée des filets (1888), Départ pour la pêche (1889), La levée du Chalut (1891) and À la côte (1900). A review of the 1889 Salon exhibition included the following remarks about his painting Départ pour la pêche (Putting out to Sea) –– M. Georges Haquette, with “Putting out to Sea”, in which… we see a barque being launched with strenuous efforts of arm and shoulder by a few stalwart men. The catalogue for the 1893 Salon exhibition included the following: Among the “sailors”, Mr. Haquette is of those who has most and better observed the character of our coasts’ fishermen as well as the marine life itself. “Retour au port” (Return to Port) has the smell of spindrift, this is a “good catch”, it is at the same time just in effect, in sentiment and in attitude; this little pensive ship-boy already possesses the seriousness of the old sea-dog, and the old-salt, whom is at the helm, thrown back and bending his back, his head behind, is one of our old acquaintance from the seaports. Haquette’s painting Net Fishers was illustrated in Famous Paintings of the World, Photographic Reproductions of Great Modern Masterpieces (1894, pg. 290) with the following caption: It would seem to be not a difficult matter to make interesting pictures in a country where there are picturesque peasants in native costumes and wooden sabots, and where, among other odd local customs, women fished from off sea-walls with nets of quaint and curious construction. And, artistically, that is the advantage of peasant countries – there is an abundance of pictures on every side. That to be sure, is a small advantage to offset what the poor peasants have to undergo to toil and privation, merely that we may have pictures! But so long as there are peasants anywhere, foreign artists will paint them for us, as the French artist Haquette has portrayed this fisherwoman of the French coast and her little assistant. How strikingly this strong, well-poised figure stands out against the background of sea and sky, as the woman throws her weight on one foot, the other foot being slightly raised in the movement with which she throws upon the parapet the wriggling contents of her net, and reaches out her left arm to keep the net in position! The action of the little girl is not dissimilar, though a stooping motion is indicated in the pose. The net has come up well filled with eels and turbot and other sea fish. The strident voices of the fisherwomen will soon be calling through the streets of the village on the shore the virtues of the catch they have with so much labor brought to land. Haquette continued to paint and exhibit at the Paris Salon until his death in 1906. 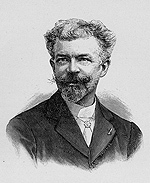 Today examples of his work can be seen in museums in Brest, Dieppe, Mulhouse, Pontoise, and Rouen.